Last week, we posted in detail about the rule violations that led to a shark-diving accident off Mexico's Guadalupe Island. Shortly afterwards, a second accident (featured in a YouTube video) went viral online. Some media reports have confused the two encounters, as well as the facts in our report. So, let's set the record straight. First off, the incidents did not occur on the same vessel. The cage dive we wrote about – which blatantly ignored regulations and endangered the lives of four people – happened aboard the luxury vessel Nautilus Explorer, on a submerged dive some 30 feet below the surface. After being lured to the cage, a 15-foot white shark severed the air hoses of the divers inside, before becoming trapped in the cage with them. The more widely shared video, which features a shark leaping up through a cage that is anchored at the surface, occurred aboard the Solmar V.
Here's an important distinction: contrary to several media reports, baiting the water during a cage dive is not illegal in Guadalupe. What is illegal is baiting on, over or too close to a dive cage. The submerged dive aboard the Nautilus Explorer very clearly broke cage-diving regulations. For starters, they anchored a chum bag to the cage itself. This is explicitly prohibited by the Guadalupe shark-diving code of conduct, which was put in place by the National Commission of Natural Protected Areas (CONANP), one of the area's ecotourism governing bodies. It's also worth noting that this is the third time we've seen illegal behaviour from this diving outfit. The team has yet to speak out about their accident, and has not responded to requests for comment. More on that here. The surface incident with Solmar V is a little less cut and dried. This dive operator is well respected and has a history of managing its bait properly. CONANP regulations state that bait must be immediately removed once an approaching shark is within 6.5 feet (2 metres) of a standing vessel. There has been some debate on whether this regulation was met; however, the general consensus among the experts we spoke with is that it was. What does appear to break the rules is the angle of the pull itself. Regulations state that bait must be "thrown in an angle 45 degrees from the cage to the outside of the boat", and pulled in so that the bait does "not touch the cage or pass over the top of the cage". Solmar has addressed this issue in an open-letter response. 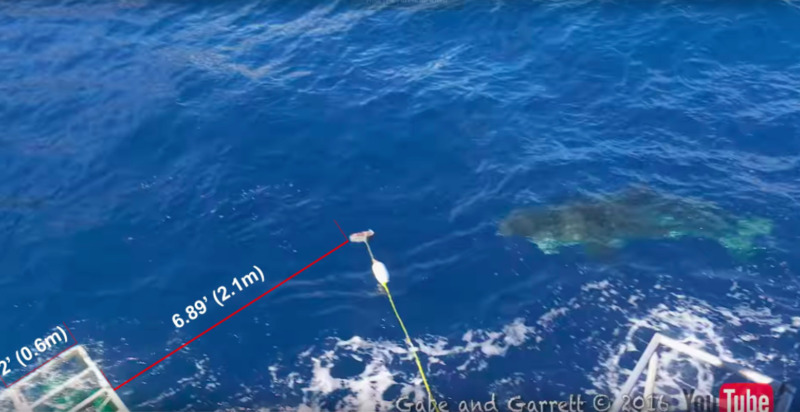 According to the statement, the operator has reinforced its cages in the days since the accident (one of the bars was broken by the lunging shark), as well as extended the zone around the cage where bait cannot be dropped. "A meeting with other dive operators will take place later this month in order to work together to minimise unfortunate events like this," Solmar said. Should cage diving be outlawed? For many commenters online, incidents like this serve as proof that the cage-diving industry should be banned. This, of course, is a matter of opinion – but it's important to remember that such accidents are rare. What is needed most is better enforcement of existing regulations. If repeat offenders are not held accountable, they will continue to put both sharks and divers in danger. Some reports suggest that accidents like this are "good for conservation,"* but the reality is that they are both bad for sharks and damaging to an industry that has the potential to do some good. Most scientists and conservationists agree that exposing the public to sharks in their natural habitat can help to mend a reputation that's been battered by films like Jaws. But this can only happen if divers follow the rules – including the rules that apply to baiting the water. You can read more about the known biological effects, existing concerns with and potential conservation benefits of shark ecotourism in this collaborative investigation. I have been in the water with great white sharks, and the experience was both extremely calm and safe. But how do you know if you're picking the right diving outfit? Your best bet is to familiarise yourself with the local regulations (here are the codes of conduct for Guadalupe, South Africa and New Zealand). The next step is to ask questions before agreeing to the dive. As a general rule, avoid operators who dive close to other human-use areas like popular beaches, bait directly on the cage, and those who allow participants to exit the cage, or touch and hand-feed passing sharks. Cages that use round, tubular bars rather than traditional square-edged bars are less likely to cause injury to sharks that pass too close. * The National Geographic article initially titled "Why Sharks Getting Stuck In Diver Cages is Good for Conservation" has since been re-titled "Why Sharks Are Getting Stuck in Diver Cages." A large ragged-tooth shark at a South Korean aquarium has been caught in the act of swallowing a smaller hound shark. Scientists have a new tool for examining insects ... and it's made from Lego!